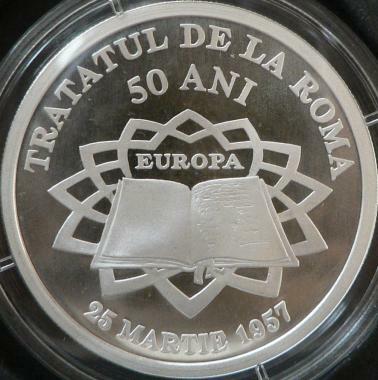 The coin commemorates 50 years from the signing in Rome of the Treaty of the Establishment of the European Economic Community. The treaty was valid since January 1st 1958. The Treaty of Rome is considered to have marked the beginning of the European Union. 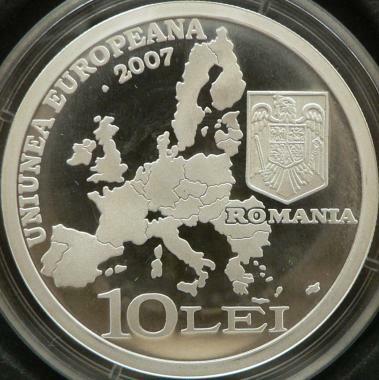 The event was celebrated with anniversary coins by many countries. 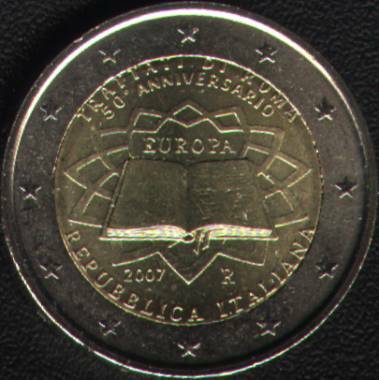 In the euro zone, 2 euro anniversary coins were issued. At least some of these 2 euro coins share the same main design - Capitol Square in Rome and the page with the signatures. We must observe that on the map of the European Union on the obverse the boundaries between the countries are represented by lines. However, the boundaries between Bulgaria and Greece, between Denmark and Germany and between Lithuania and Poland are missing. Luxembourg was not represented - maybe because it is very small, and Malta is missing completely, the corresponding space being covered by letter L from LEI. The design with the 12 ray star imagined by Michelangelo Buonarroti (1475-1564) for the pavement of Capitol Square in Roma became a reality in 1940 only, subsequently to the command of Italian dictator Benito Mussolini. The popes of yore did not agree to the design of the star, because its esoteric meanings did not conformed with the Christian dogma. In the center of the star a copy of the statue of emperor Marcus Aurelius is placed (the star and statue are represented on the Italian regular 50 eurocents coin).